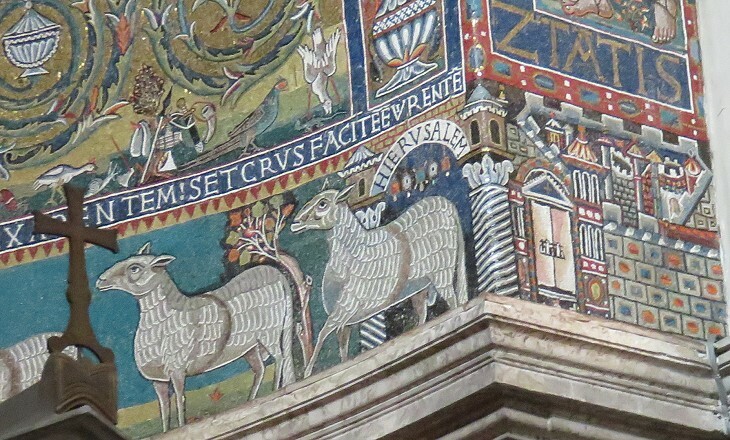 You may wish to read an introduction to this section and a page covering Ostrogothic Ravenna first. 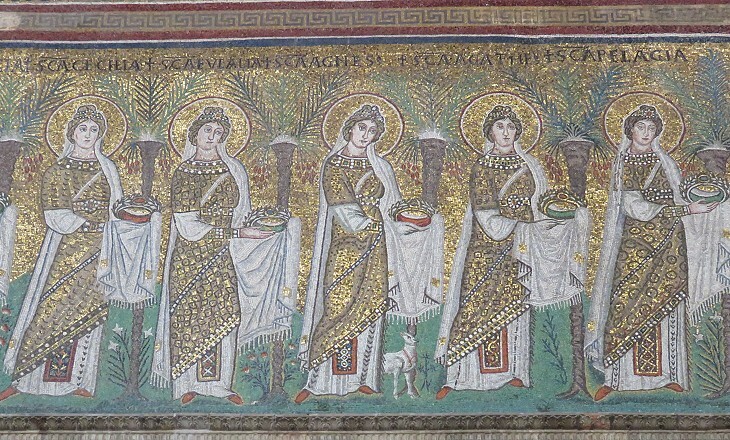 This page covers S. Apollinare in Classe and some mosaics at S. Apollinare Nuovo which were made during the Byzantine rule. In the storey below, processions of saints, men on the south side, women on the north, corresponding to the division of the sexes of the congregation below, occupy the whole length of the nave above the arcade. (..) What the Catholics found to object to in Theodoric's processions we cannot tell, but it is obvious that they destroyed them and substituted the monotonous figures we now see in their place. 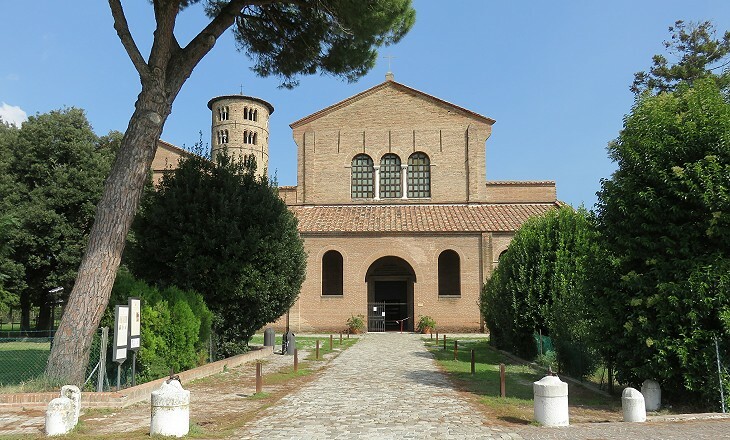 S. Apollinare Nuovo was built during the reign of King Theodoric as a church for the Ostrogothic/Arian community. 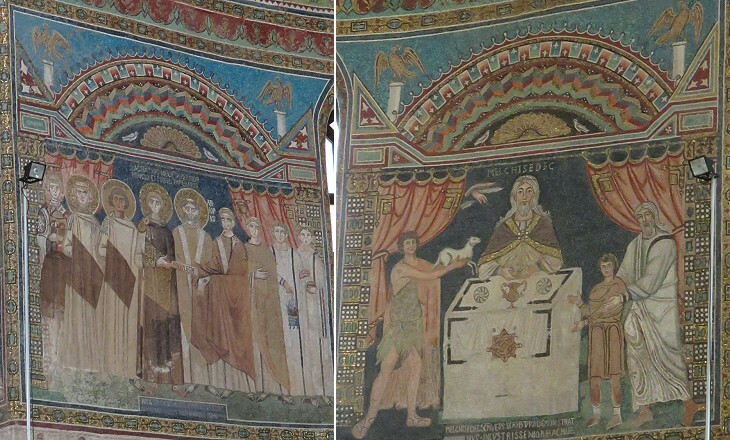 Changes were made to the decoration of the church by the Byzantines after they conquered Ravenna in 540 and eradicated Arianism. The Romans did not wear trousers; these were typical of the Dacians, the inhabitants of today's Romania, who were often portrayed in a costume similar to that of the Magi, but as prisoners of war. The Dacians however did not have embroidered trousers which were instead worn by people living near the eastern border of the Empire, such as the rich inhabitants of Palmyra or the Sassanid kings. The Byzantines dedicated the church to St. Martin of Tours, a strong opponent of Arianism. In the IXth century it acquired its current name when St. Apollinaris' relics were moved there from Classe. It underwent changes and additions in the following centuries and some of them will be covered in pages to be developed. In the XXth century the original aspect of S. Apollinare Nuovo was partly restored by reconstructing the balustrade which separated the altar from the nave. The cloister and the church house some ancient inscriptions and fragments of decoration. An inscription is of particular interest because it makes reference to Claudius II who ruled the Empire from September 268 to July 270, during a period of military anarchy. Emperor Constantine claimed to descend from that emperor in order to assert the legitimacy of his power. Oscar Wilde - Ravenna - Newdigate Prize poem recited in the Sheldonian Theatre Oxford June 26th, 1878. Classis Ravennatis (Fleet of Ravenna) was one of the two branches of the Roman Fleet after its reorganization by Emperor Augustus. It was responsible for the protection of the maritime routes which linked Italy to the Eastern Mediterranean provinces. The other branch was situated at Cape Miseno in the Gulf of Naples and was responsible for the maritime routes to Africa and Spain. The Chief Admiral was at Cape Miseno. Most of Classis Ravennatis was moved to Constantinople after 330. The harbour of the fleet (aka Classe) lost completely its importance after Ravenna was conquered by the Longobards in 737. 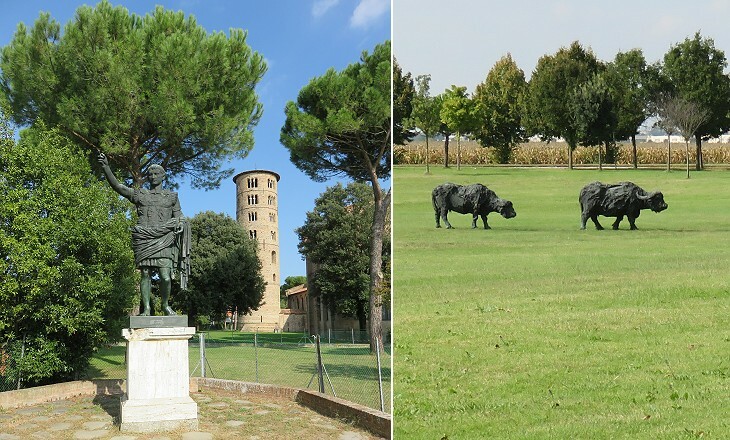 As early as the sixth century, the sea had already retreated to such a distance from Ravenna that orchards and gardens were cultivated on the spot where once the galleys of the Caesars rode at anchor. Groves of pines sprang up along the shore, and in their lofty tops the music of the wind moved like the ghost of waves and breakers plunging upon distant sands. This Pinetum stretches along the shore of the Adriatic for about forty miles, forming a belt of variable width between the great marsh and the tumbling sea. From a distance the bare stems and velvet crowns of the pine-trees stand up like palms that cover an oasis on Arabian sands; but at a nearer view the trunks detach themselves from an inferior forest-growth of juniper and thorn and ash and oak, the tall roofs of the stately firs shooting their breadth of sheltering greenery above the lower and less sturdy brushwood. Today S. Apollinare in Classe is four miles from the sea. 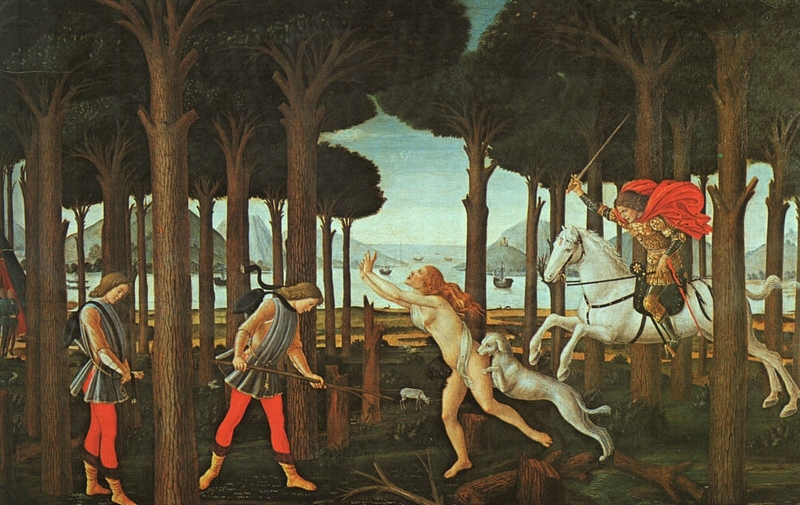 You may wish to see a painting (it opens in another window) set in the pinewood of Ravenna by Sandro Botticelli (History of Nastagio degli Onesti - part one - Prado, Madrid). Between the city and the forest, in the midst of malarious rice-swamps, stands the finest of the Ravennese church, the stately temple of San Apollinare in Classe. (..) Its extreme loneliness makes it doubly impressive. The construction of the church began when the Ostrogoths were still in power, but the interior was entirely designed and decorated after the 540 Byzantine conquest. The cost was borne to a large extent by the banker Julianus (Lat. argentarius means money changer/banker) who was involved in the financing of S. Vitale too. 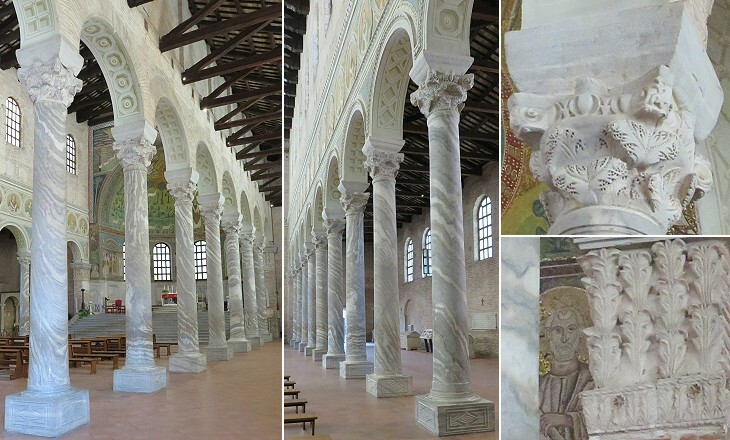 The columns were made up of Proconnesian marble, which was quarried on an island in the Sea of Marmara, near Constantinople (rather than cipollino, as stated by James who relied on the advice of a Murray's Handbook Guide). 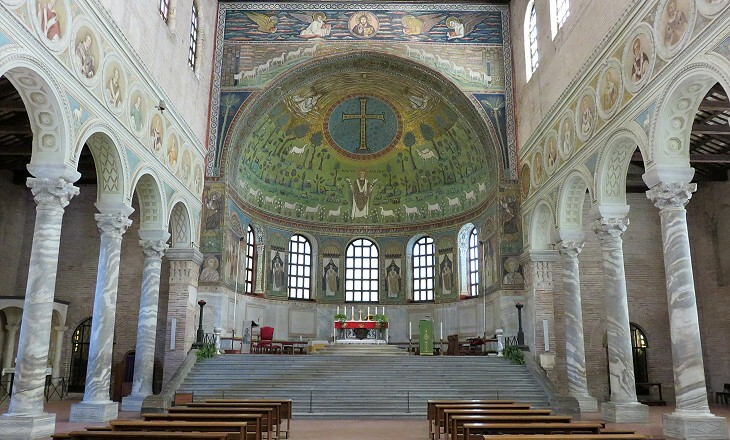 You may wish to read Jackson's description of the Euphrasian Basilica at Parenzo where he made many comparisons with S. Apollinare in Classe. 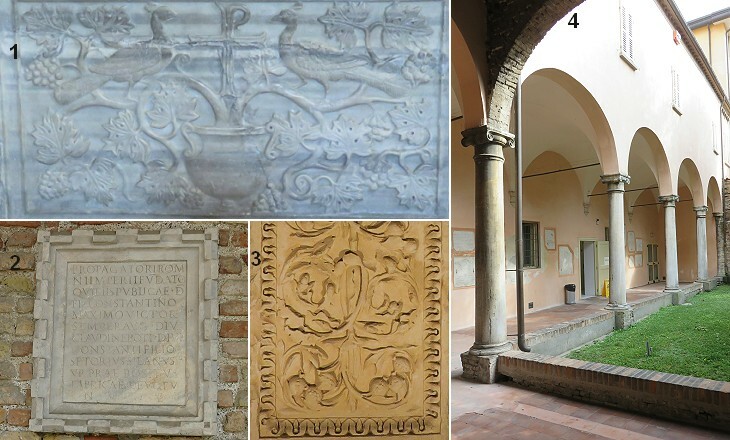 In the XVth century the marbles which covered the walls of the side aisles were carried off to Rimini by Sigismondo Malatesta to decorate his family tomb. 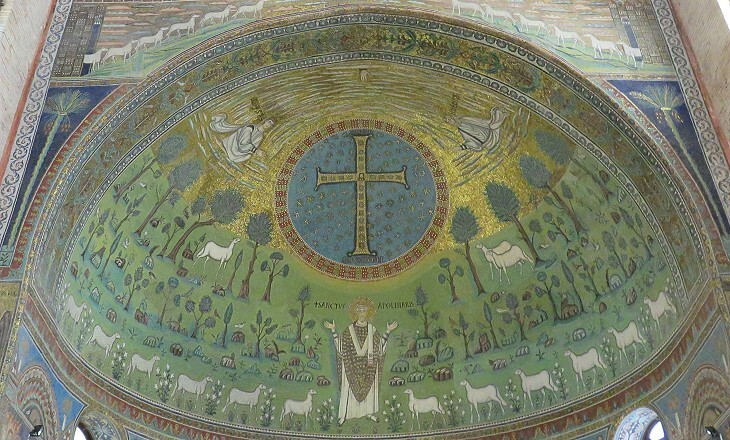 The upper part of the apse mosaic is a metaphorical representation of the Transfiguration; the hand of the Almighty is seen pointing down to a small figure of the Saviour, introduced into the centre of a large Cross surrounded by a blue circle studded with stars. On the arms are the Alpha and Omega; and at the foot the words Salus Mundi (Saviour of the World). 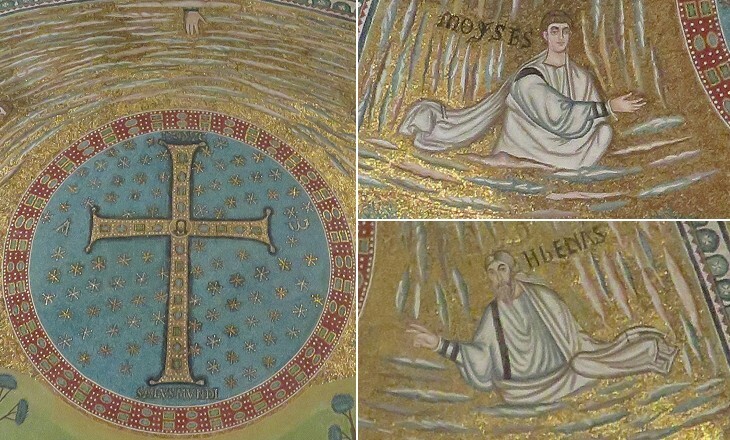 Outside the circle are Moses and Elijah who indicate the Cross with their hands. They appeared to Peter, James and John and they talked to Jesus (Matthew 17). 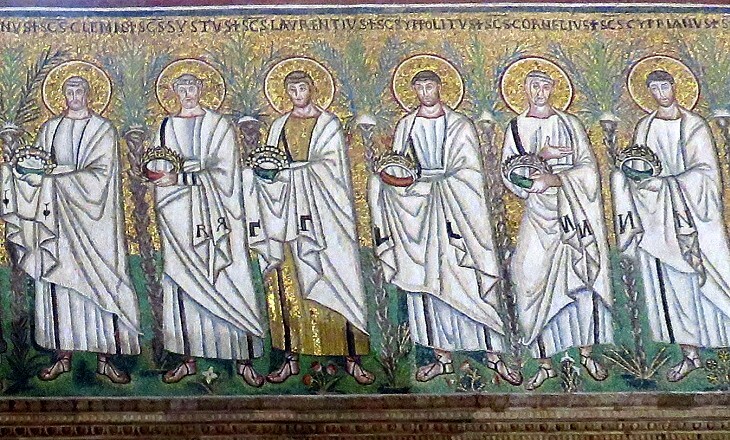 You may wish to see a modern mosaic portraying the Transfiguration in the Franciscan church on Mt. Tabor, the site where, according to tradition, the event took place. 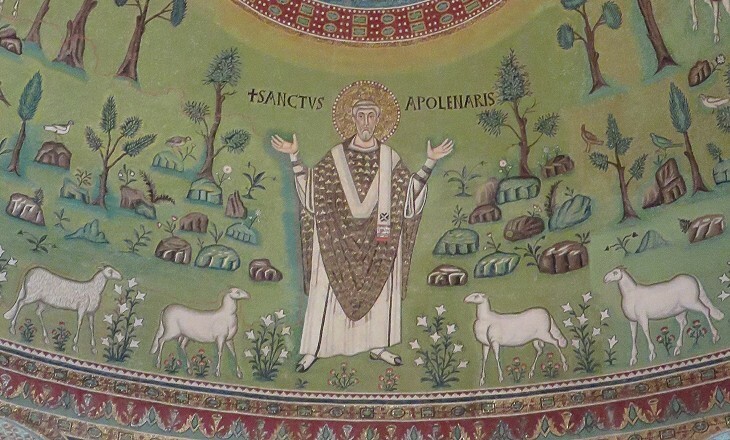 St. Apollinaris in archiepiscopal robes preaching to a flock of sheep, a symbol for a Christian congregation, is depicted in the lower part of the apse mosaic. Behind them a landscape of trees, flowers and birds represents perhaps the Garden of Eden, the perfect state of the world which will be restored. Apart from the religious aspects the overall design of the mosaic is unusual because it portrays a very limited number of subjects. 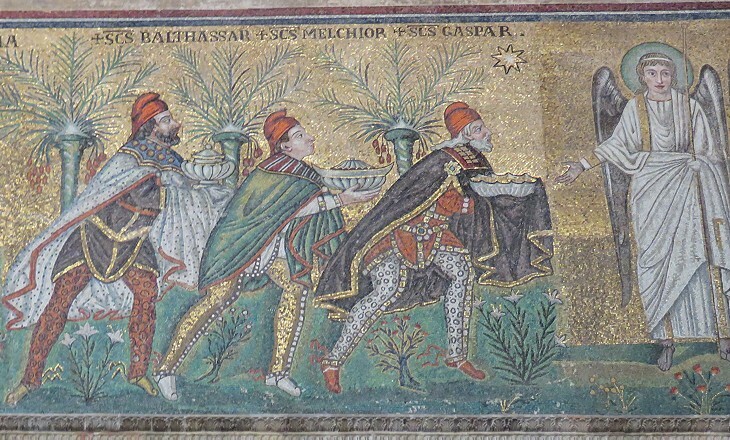 You may wish to see a page on the mosaics of Rome, which are more "crowded" with figures and decorations. Do Italian churches invite to prayer? The answer of most foreigners and of many Italians as well is negative, because they are too richly decorated and the eye is attracted by too many things. 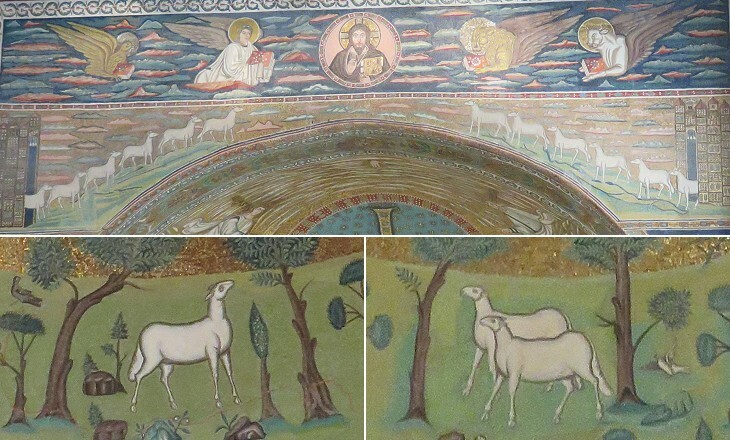 S. Apollinare in Classe, notwithstanding its polished marbles and glittering mosaics, is different in this respect, because one feels that it was designed in a period of great religious fervour when the presence of God was very pervasive. The only part of the decoration which is driven by earthly matters is a mosaic portraying Constantine IV, Byzantine Emperor in 668-85. 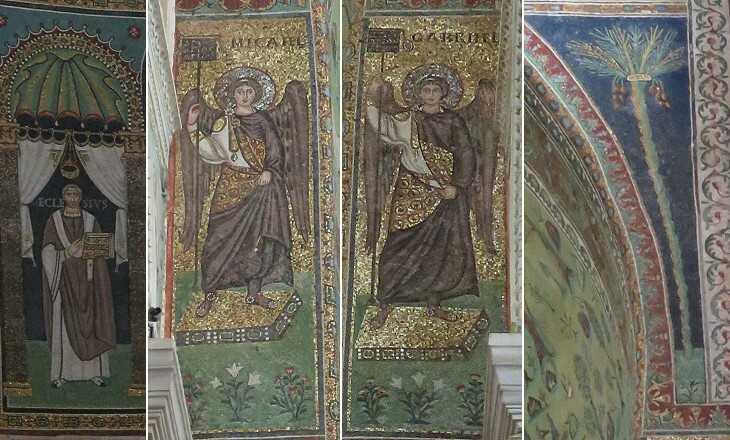 It might have replaced a previous one portraying Emperor Justinian as at S. Vitale. It is interesting to note that all the inscriptions were written in Latin including those related to Constantine IV, although in the 620s Greek had become the official language of the Byzantine Empire.